Composer and poet, Arrigo Boito was born in Padua in 1842. Musician of great culture, he was one of the pioneers in the innovation of Italian melodramma with his opera Mefistofele for which he wrote both the music and the libretto. The work, initially withdrawn in Milan in 1868, once revised triumphed in Bologna in 1875 also thanks to the involvement of two artists from Parma: the conductor Emilio Usiglio and the tenor Italo Campanini. Nerone elaborated over a long time span, and of which the home study preserves the autographed preparation material, was performed posthumously in 1924 upon the will of Arturo Toscanini. He was the author of the libretti of some famous melodrammi, among which Gioconda for Amilcare Ponchielli, Otello and Falstaff for Giuseppe Verdi, Ero and Leandro for Giovanni Bottesini, then Luigi Mancinelli. The Conservatory of Music of Parma was named after him as, pressured by Giuseppe Verdi to preserve his friend Franco Faccio's place, he accepted to direct the School giving new impetus to the school for voice. The home study passed to senator Albertini. Boito's heirs, after it having been passed through various hands, directed that it be kept in Parma, along with the study of Arturo Toscanini. 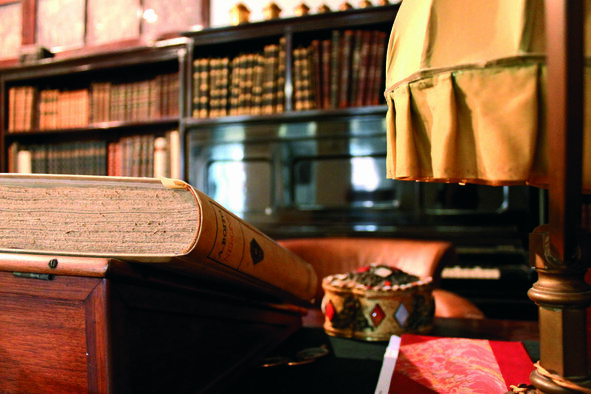 The library, typical of a cultured humanist of the late 1800's, comprises significant works such Diderot's Encyclopedia, Latin classics in editions of the centuries passed, European literature, D'Annunzio books with dedication. Arrigo Boito. Giuseppe Verdi. The furniture is comprised of bookcases, a writing desk, chairs, and of a small sofa with armchairs, a wooden photo casing with leather interior and a series of 87 vintage photographs of large format and an upright Scriedmayer piano with small bench. On the wall various historical framed photographs and a great print representing Giuseppe Verdi with his dedication. 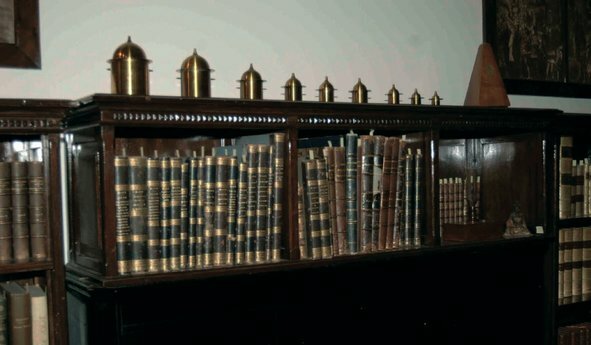 To the right: Bookcase with Helmholtz resonators composed of 9 pieces in metal (bell shaped). 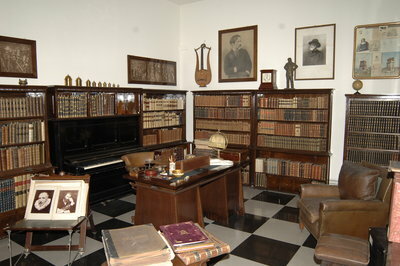 To the right: Perspective of Arrigo Boito’s home study.